As a mom, I care what I put into my children’s bodies. I only want my kids to consume the best quality ingredients and that includes their vitamin supplements. That is why I am IN LOVE with Pure Matters. Pure Matters is not just any ordinary vitamin and supplement company—they are the best of the best. They only create supplements and vitamins crafted from the most wholesome, natural ingredients. Each formulation is perfectly balanced and tested rigorously—their standards not only meet testing expectations, they exceed them. Pure Matters maintains the highest quality control procedures and above all, they promise that each product will have NO hidden ingredients. Many other vitamin companies often add blending agents that dilute the amount of active ingredients, but Pure Matters promises to NEVER add artificial or hidden ingredients to their supplements. With over a century of pharmaceutical heritage, you can trust that each formulation is perfectly balanced and tested to the highest standards. Now that is a vitamin company I can trust and stand behind! My kids go to daycare and they used to bring all sorts of nasty bugs home. In desperation of trying to keep them healthy, I started giving them a multi-vitamin to help boost their little immune systems. I tried a few different kinds, but was always a little skeptical of the ingredients in some of the vitamins we tried. Many of them had added sugars and ingredients that I can’t even pronounce, which always made me a little skeptical of them. I was so thrilled to find the Pure Matters kids chewable vitamins! 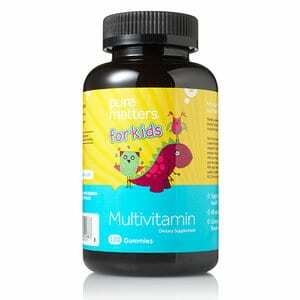 Pure Matters Kids’ Multivitamins deliver vitamins A, C, D, E, B12, folic acid and choline in yummy, dinosaur-shaped gummies made of only the highest quality natural ingredients. Reece loves them; he says they are “yummy dinosaurs” and I love them because they have no hidden ingredients; just pure, wholesome natural goodness. Reece actually asks for his vitamin every morning at breakfast; it is the highlight of his meal! One special note to make about Pure Matters is that if your child suffers from allergies, this would be a good brand to try. Pure Matters products are formulated to avoid common allergens, sugar and preservatives. They use only natural colors, sweeteners, flavors and coatings. 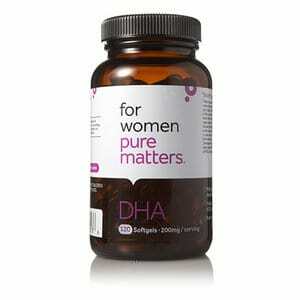 I have also been taking the Pure Matters Prenatal Daily Multi-Vitamin and I am a big fan. I feel like when taking them, I have more energy and I don’t get that “it’s 3pm and I desperately need a nap feeling”. That is important to me because with two young children, I need a lot of stamina just to keep up with them! The Pure Matters Prenatal Daily Multi-Vitamin would be perfect for any expecting or nursing mother. It is an excellent source of omega-3 fatty acids and it provides a vegetarian source of DHA, which helps support brain and eye health. Another product that I love is their Chocolate Pea Protein Powder. I drink a lot of protein shakes for breakfast since our house is always crazed in the morning and I just need something healthy and quick. I LOVE, LOVE, LOVE this protein powder! This vegan, plant based protein source is derived from yellow peas and is an ideal source of protein for vegans, people with allergy related dietary concerns, or moms like me that just want something that is not only healthy, but delicious! I have tried many protein powders and this BY FAR is my favorite. Many protein shakes taste grainy and end up being very clumpy, but not this protein powder—not only does it mix very well, it also truly tastes like a delicious chocolate dessert. 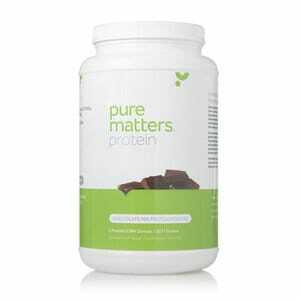 If you eat protein shakes on a regular basis, make this switch to the Pure Matters Chocolate Pea Protein Powder—I promise, you wont be disappointed! Pure Matters is totally committed to YOU! They will deliver on time and what they say is in the bottle…is in the bottle. They will use only wholesome, scientifically proven ingredients composed in clean facilities. And when their formulations can be improved, they will improve them. They will clearly and simply present the facts, and will not endorse products they do not believe in. Your satisfaction with their products and service is their number one priority. If, for any reason, you are unhappy with one of their products, simply return it for a full refund of the purchase price. They will gladly accept returns of packages—no questions asked—within a FULL YEAR of the sale date. (Now that is an amazing return policy!). Their experts create and share educational articles related to your health needs, exercise, diet and more. Take some time to read their up-to-date information related to your health questions and regimen. They’re dedicated to sharing knowledge about how to stay healthy and happy. Moms, if you are looking for vitamins and supplements to promote your family’s overall health, you MUST check out Pure Matters. As moms, we don’t have time to worry about the ingredients we put in our child’s bodies—Pure Matters takes all the guess work out for you and only delivers the finest and most natural ingredients so you have one less thing to worry about! Pure Matters offers vitamins and supplements for your whole family’s needs; from immune and health support to fitness, Pure Matters has it all! To find out more about their products, visit their shop at PureMatters.com. You can also follow them on Facebook and Twitter for recent product news and events. *I received products for review, but these words are strictly my own. Stop Spending Money on Expensive Nursing Camis: Check out this DIY Nursing Cami Tutorial! Do you know if Pure Matters went out of business? Unfortunately I believe so. I went on to order more kids vitamins and it looks like they did. We never received an email from their company reps telling us so, but it definitely looks that way. Can you tell me at what mall? Hi Staci, Unfortunately they are no longer in business. my interest is in natto kinase and serrapeptase I would like your input about it I’m going to ask my doctor two of course. I am currently taking Plavix but I want to go natural and only take nattokinase and serrapeptase is it safe than to come off of Plavix?